Student leaders have described as "truly awful" the record of Scottish universities on admitting students from poorer backgrounds. Figures were obtained by the National Union of Students (NUS) in Scotland using a Freedom of Information request. They said older universities each typically recruit fewer than 100 students from deprived backgrounds. The universities have defended their efforts to recruit a wider range of undergraduates. The figures were compiled using the government's Scottish Index of Multiple Deprivation (SIMD). Edinburgh and Aberdeen also recruited fewer than 100 students from these "SIMD 20" districts. NUS Scotland said both Dundee and Glasgow "do much better". Robin Parker of NUS Scotland said: "University places should be given to those that have the most talent and potential. "Unless institutions do more to widen access, they're missing out on some of those with the most potential, that could get the best degrees, and quite frankly, not doing their job properly. "Making access fairer is incredibly important, but that doesn't mean it's difficult to do." 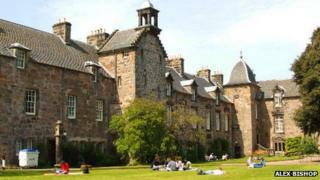 St Andrews University said it was making efforts to attract a wider range of students. A statement from the university said: "The top universities in this country are open and accessible to all - but we need much more support from society at large to engender the belief in young people that the brightest can come here, and succeed. "Like other universities, we are conducting lots of outreach work, a range of innovative programmes and running summer schools to encourage bright young people from deprived areas to choose a university education. "For as long as we do that in isolation however, our progress will be limited." Aberdeen University said it recruited many of its students from north-east Scotland, which has fewer districts which fall into the SIMD 20 category. NUS Scotland insisted, however, that more could be done by universities. Robin Parker added: "Scottish universities are currently drafting up agreements on widening access with the Scottish Funding Council. "These statistics should act as a wake-up call and empower universities to take the steps required to make access fairer in Scotland." Alastair Sim, director of Universities Scotland, which represents Scotland's higher education institutions, said universities were working "hell for leather" to rectify the situation in terms of places for students from disadvantaged backgrounds. He told BBC Radio Scotland many of the inequalities in education begin much earlier, in school or even pre-school. He added: "If you look at the attainment of five-year-olds, you find some absolutely shocking differences according to whether they're from a challenged background of not. "There's an 18 month attainment gap in verbal skills between five-year-olds from the most privileged backgrounds and the most challenged backgrounds, so there's a huge systemic issue for Scotland about making sure at every stage along the line that we're helping people to realise their full potential."